Don’t be afraid of repeating yourself. 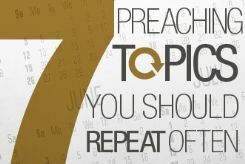 Repetition is the mother of learning — and sometimes a pastor’s best friend. “Of these things put them in remembrance….” (II Timothy 2:14). Recently I spent the morning hours in a school in North Carolina giving my little presentation we call “Lessons in self-esteem from drawing 100,000 people.” I sketch a lot of students, then segue into the talk which, among other things, urges the kids to stop comparing themselves with others, accept themselves as the persons God made them to be and to smile. Then it happened again. In truth, he had heard, but the lesson had not penetrated. Some lessons have to be repeated ad infinitum. “Let me remind you …” is a phrase that shows up a lot in the epistles of the Apostle Paul. The most important spiritual truths need to be emphasized again and again if the hearers are to truly learn them and benefit from them. 1. Jesus Christ Is The Savior Of The World And The Only Savior. That is the theme of so much Scripture anyway, isn’t it? How could we not keep the focus on the Lord Jesus — His identity, His life and ministry, His teachings, His headship over the church and His place in our lives — if we are being true to the Word? Jesus Christ is Lord, for now and for eternity, and no one else is. Always stay focused on the Lord Jesus with your people. 2. The Church Is An Essential Part Of The Lord’s Plan, For Now And Forever. And we are most definitely not referring just to your local congregation. As important as that is — this will come as a surprise to a lot of lonely myopic pastors—the Kingdom of God is more than your church. When Jesus saved you, He knew something you were about to find out: “You cannot live this new life in isolation. You need the family of God.” They hold onto you; you hold onto them. They instruct and nurture you; you turn around and do the same. This symbiosis has been God’s plan from early on. “I will build my church,” the Lord said in Matthew 16:18. It’s His and He builds it. The Christ-follower who claims to be able to live for Christ better without the church is insulting His Lord. The church-leader who would run the Lord’s church “for Him” is asking for big trouble fast. 3. Salvation Is All About The Cross. Salvation is not by works of righteousness but humility, repentance and faith in Jesus Christ and what He did on Calvary. The threat to turn salvation into a matter of works will never go away. It’s grounded in man’s way of thinking, his human (and thus self-centered) reasoning. To my knowledge, most of the religions of the world teach variations of “do this and you’re saved” or “do not do this and you are saved.” Only one, to my knowledge, proclaims that everything necessary has already been done and our task is to repent and receive it (“Him”). Celebrate the grace of God, preacher, with your people. Keep them at the cross. Good works have a definite place in the plan of God for His people. But they are the results—the fruits, the evidence—of our salvation, not the means. One wishing to become a member of the military does not do so by wearing a uniform and saluting officers. But once he is officially inducted, he wears the uniform, obeys commands and salutes officers. 5. If You Have Faith, You Will Pray. In fact, nothing tells the story about your faith like your prayer life. Nothing. Consider that you are praying to a Lord you have never seen and cannot prove. You say things to Him you would say to no one else and believe that He hears. Furthermore—and this is the clincher—90 percent of the requests you make, you’ll never know whether He answered them or not since He may choose to do so in subtle ways or at another time. But there you go, praying to Him day after day, as though He were occupying the chair next to you and everything you do today is dependent on His presence and guidance. Pastors keep prayer before their people by encouraging them to pray at the altar during the services, by having a prayer room at the church and by encouraging prayer for specific people, needs, events and concerns. 6. A Church Exists By Evangelism And Missions As A Fire Exists By Burning. Sharing our faith is not an option, not for the gifted only (although admittedly some are more fluent and effective than others in this), and not to be done sporadically. “As you go, make disciples” was the command of our Lord in Matthew 28:18ff. I stood in the foyer of a church of another denomination one day, reading their poster on evangelism. (You do not need my help in identifying the denomination by what follows.) The poster said something like, “Spread the word. Tell people about John Wesley.” I thought, Wesley? Tell them about Wesley? That’s not evangelism! That’s the sort of in-house instruction one might wish to do with those who have been converted to United Methodism. But it’s no way to reach the unchurched, uncommitted or uninterested. Churches must be creative in finding ways to mobilize their members in spreading the faith, must be aggressive in supporting those who are getting it right and doing it well, and must be alert to the distractions which would push evangelism down the list of priorities in the church’s ministries. 7. The Bible Is The Inspired Word Of God And The Spiritual Nutrition Of Believers. Those are all lies out of hell. You do not know the Bible. You have not read it. (You may have read “at” it, but there is a world of content there which you have not yet mined.) It is not boring. You are boring, not the Word. Keep telling them, pastor. Keep preaching its insights and delighting in its treasures, and eventually they will get it. Repetition is a great teacher. In fact, it may be the best teacher on the planet. Dr. Joe McKeever is a preacher, cartoonist and the retired Director of Missions for the Baptist Association of Greater New Orleans. Currently he loves to serve as a speaker/pulpit fill for revivals, prayer conferences, deacon trainings, leadership banquets and other church events. Visit him and enjoy his insights on nearly 50 years of ministry atJoeMcKeever.com.